I probably wouldn't even mention this here, except it's the foot I use on the sewing machine pedal. Years ago I had plantar fasciitis after getting a hairline fracture on one of the tiniest bones in my right foot. I had to stop walking (50km a week), using stairs, and even sewing a single seam would flare it up again. I couldn't get my head around switching to the left foot, though I might try that this time. Back then, the problem lasted years until I found someone who treated it in away that I have barely had a flicker in the past 8 years. Unfortunately I've sprained my left ankle 3 times in 5 weeks, and the third time I tripped I couldn't regain my balance so hit the ground. Not only re-injuring my left ankle but upsetting my right achilles tendon, and in turn the pf has flared up again since Sunday. Thankfully the therapist who treated it last time - and has been overseas for 3 years getting her Masters - has been back in Sydney for a few months and I have an appointment with her next Wednesday. I'm also seeing a remedial massage therapist today, and hoping it's only a short term problem. Last time I got around the sewing issue by buying Baby - a 1960s Bernina 730-record - that has a knee lever instead of a foot pedal. The difference between the 730 and the 730-record is the record was the upscale version with more than a dozen stitches where the 730 was the plain version with straight and zigzag. 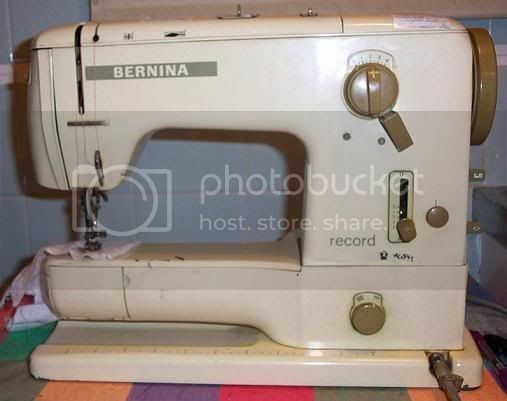 Growing up my mother had the foot-pedal version of this Bernina, a green Elna Supamatic with the knee lever control, and a hand crank Singer with a motor added. After getting antsy from a lack of sewing as therapy (cos I really missed walking to/from work) as well as missing sewing as a hobby/passion I remembered mum's Elna with the knee control and hunted down a (now closed) sewing machine place that had a stack of trade-ins he refurbished and sold. He didn't have the Supamatic but did have a couple of knee control machines including Baby (above) so I made an appointment to test & buy one. It's such a great machine to sew with and during the years pf was a problem I also bought back-up-baby (another 730 Record) and mini-Baby below from the original german-migrant owner. It's a Bernina 125 Jubilae. 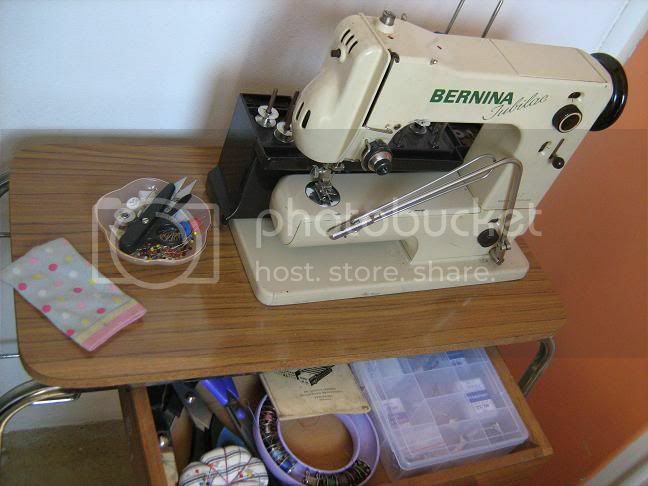 I also starting eyeballing eBay for a Bernina 530, because maybe this was becoming an addiction. 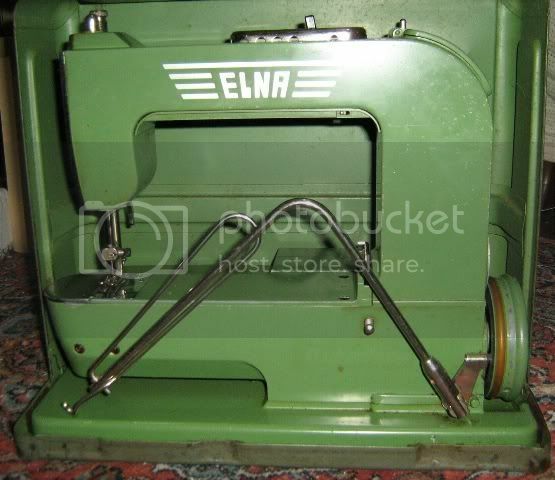 I might have been a little enthusiastic about the engineering in these vintage machines because I also got an Elna #1 - known as the Grasshopper as it was lighter weight to take to sewing classes & workshops. Plus a Phoenix APHA - a post WW2 machine similar to the Grasshopper that was made by the Anker, Phoenix and Eagle factories. Sadly I didn't open that parcel in any kind of hurry - My.Bad as I knew I should have and then discovered the bobbin case was missing. I've been trying to find a bobbin case ever since. I was also gutted that during the year after the stockmarket crash when I was profoundly underemployed (12 weeks without work & 7 months of 3 days pw) that a Messerschmidt postwar sewing machine was sold in Melbourne on eBay and I simply had no money. If I can't get my left foot to adapt to sewing (aka until the treatment has worked) then I'll get the Grasshopper out of the wardrobe and use it at home. Baby is in my storage room and is too heavy to haul up the stairs at the moment. I'd love to find out who you go to for the PF. My husband has developed it. I've printed out exercises for him to do, but I don't think he's being very compliant! Relentless optimism & sarcasm seem to be my default settings :) I remember about 25 years ago when I was really really sick my GP told me that I just didn't give up (years later he told me that he'd thought of hospitalising me for tests but worried that I might give up if he had).